Parent: What did you learn about in school today? Parent: ??? What class was this in? Anyway, we have a real live Gone to Korea child in our family, although right now, she's Gone to Canada and won't Gone to Korea for a few more hours. Hayley started talking about studying abroad a year ago, pretty much since she got dropped off at BYU and started taking Korean. She's done all the work to make it happen. Applying to the program, applying for grants/scholarships, getting passport, getting visa, filling out all the paperworks that aren't applications, calling the bank, getting shots, amassing $$ to fund herself (working 2 jobs over the summer), buying plane tickets, getting a shuttle from airport to housing, and who knows what else (since she did it herself). Pretty much the only thing Jim helped her with (I'm no help) was assisting with printing her boarding passes. How can a week go by so fast? OJ was here this past week. He and a roommate drove out from Idaho and they spent the week here knocking about Minnesota, seeing sites, enjoying being on vacation from school and work. But between everyone else's work schedules, it was tough to get everyone together in one place (including Katie). Hayley and Paul quit their jobs (because they both go back to school in a couple of days) but we never did get EVERYONE together in one place. 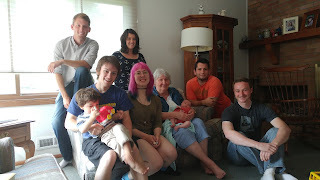 The closest we got was all five of the children and two grandchildren and me at my mother's house. Jim and Christian were not there. Alas. I did manage to get some pictures though, which will have to suffice. We'll try again for full family participation, although who knows when that will be. Christmastime, maybe? Hayley leaves for South Korea on Monday, Paul leaves for Utah on Wednesday, and OJ left for Idaho a couple hours ago.